East Austin resident Michael Reust leaves the Pan American Center after casting his vote. 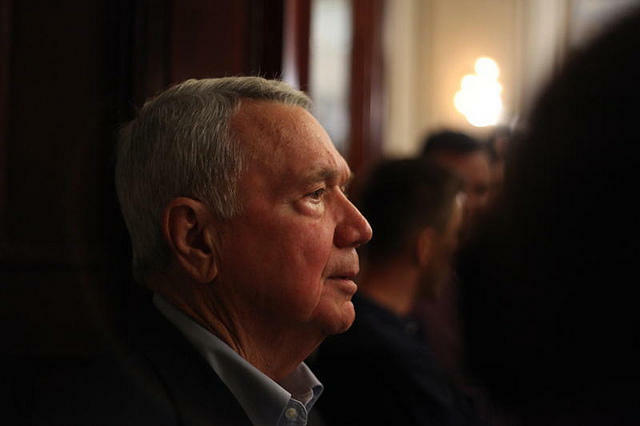 "Rail or fail," outgoing Austin Mayor Lee Leffingwell warned earlier this year. In 2000, a light rail plan that wouldn't have raised property taxes lost overall, but actually passed within city limits. The proposed line would have gone from South Congress and Ben White, through downtown then up Guadalupe and North Lamar past Parmer Lane. But back then, the vote on the plan was in all of Capital Metro's service territory at the time, and it narrowly lost because of voters outside of Austin. It failed by less than a point. Just four years later, Austin voters passed a rail line, which is now the MetroRail Red Line, going from downtown to Leander. While it has had its fair share of problems – it started late, was over budget and is still highly-subsidized on a per-rider basis – there is rail transit in Austin. This time around, to broaden the appeal of the rail line, it was packaged with $400 million in road improvements. 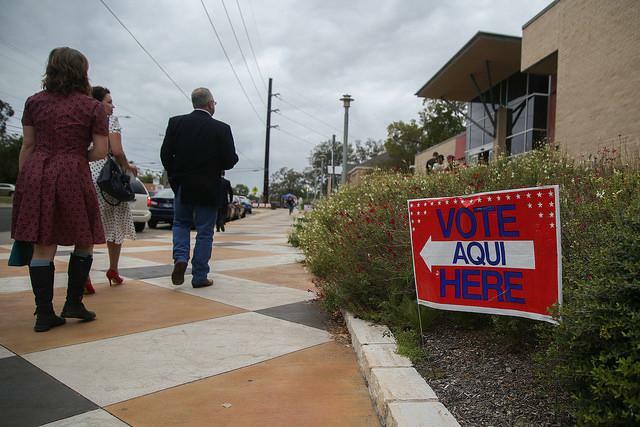 Any election has plenty of Monday morning quarterbacking, and Austin's rail and roads vote was no exception. Some pointed to worries about increased taxes, others said voters that wouldn't use the line voted against it. Another theory is that the route turned people off, because it depended on future development and density. But there's no reason to think there's just one thing that derailed the plan, and it may well be all of the above. We simply don't know. (For a precinct-by-precinct breakdown of the votes, you can check out this interactive map here. It shows much more support for the plan in Austin's urban core, and less surrounding it.) There was no exit polling in Austin, and so it's all really supposition at this point. 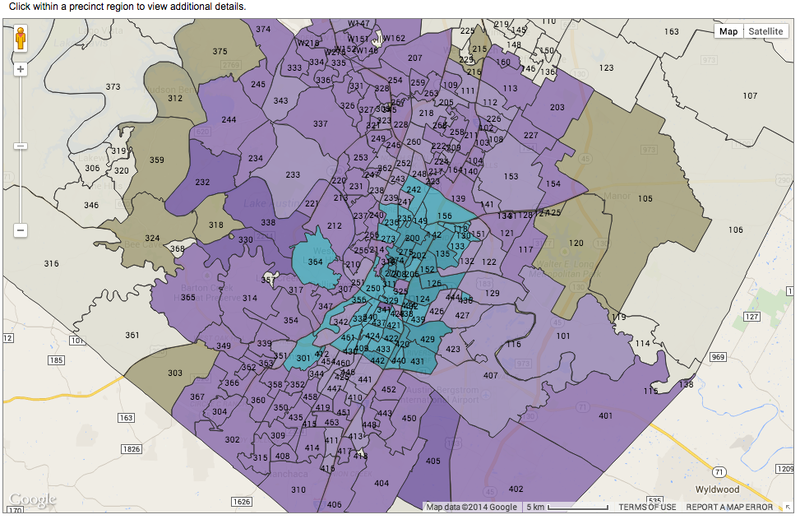 Precinct-by-precinct results for Austin's vote on light rail and road improvements. Purple = No; Green = Yes. When asked in the wake of the proposal's failure what could have been done differently, Leffingwell said, "Not a thing." But others involved more closely in the process are more contemplative. "We want to take some time to understand clearly why the project was not successful," says Kyle Keahey, the leader of the rail planning process in Project Connect, a group of regional transit agencies. "We've been taking a deep breath and trying to understand what the vote means for us moving forward. It was certainly something we hadn't planned for." Project Connect is also considering running some focus groups with voters to figure out which issues were the most important in deciding their vote. "How important was the cost? How important was the route? How important was the lack of definition of the whole system? Those are important questions we want to understand," Keahey says. And, going forward, Project Connect will take a closer look at routes other than the one they proposed this election, which was the only one that was studied closely. "We're going to try to examine in more detail some of the Central Corridor efforts. We focused on East Riverside and Highland, but we also want to provide additional focus on the other corridors, so there's a better understanding of what the system would be." This way, voters could have an opportunity to compare and contrast between the route Project Connect proposed, for instance, and one that many transit advocates pushed for, on Guadalupe and Lamar. Keahey says he doesn't think this takes the Central Corridor study process back to square one, but it does take them back halfway. Keahey notes the proposal voters shot down was less than 5 percent designed and, in order to fund it beyond that point, they needed voter buy-in. Keahey believes cost was one of the important issues on voters' minds, especially given that the measure was to be funded through property tax increases. "We understand those are issues that we need to be able to address. We need to have a larger, broader discussion on the funding options available." Keahey says it was "bold" of the City Council to ask property owners in Austin to shoulder the cost of the plan. "The appetite wasn't there for that," he says. What would some other funding options be? Any rail line is going to cost quite a bit of money, though it's feasible one could be proposed with lower capital and operating costs than the one Project Connect put forward. And Keahey acknowledges other funding options also have "limitations," but they have worked in other cities. "I think that's a broader discussion that we need to have," he says. One of those is using Capital Metro's sales tax revenue, but that is pretty much tapped out at the moment. 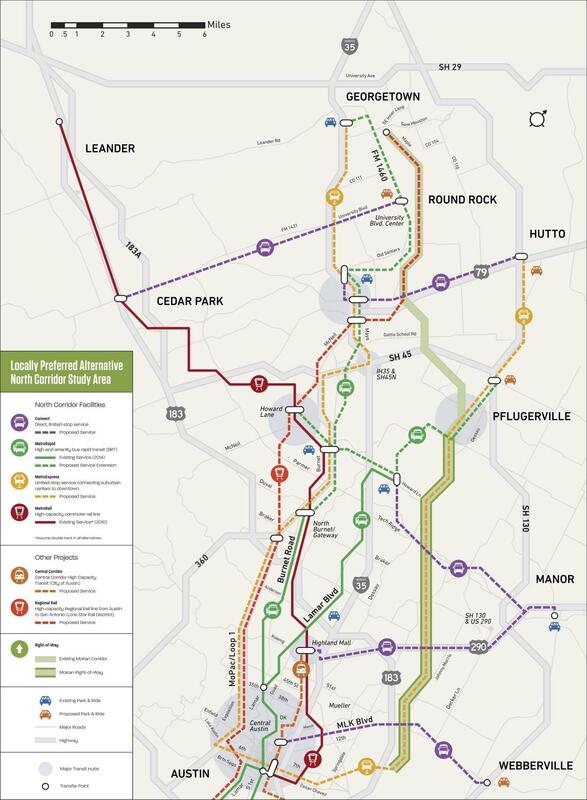 Yet Keahey notes there are cities outside of the Capital Metro service area that don't contribute to that revenue, but could perhaps be convinced to join – places like Cedar Park, Georgetown, Pflugerville and Round Rock, all of which are part of Project Connect's North Corridor study. The North Corridor proposal from Project Connect would rely on several commuter bus routes. That's right. There's a whole other corridor Project Connect is working on. It's the North Corridor, and it mostly focuses on commuter bus service from areas like Georgetown and Round Rock into downtown Austin. Since these areas aren't in the Capital Metro service area at the moment, funding these routes is the big question before Project Connect. "Those funding discussions are going forward right now," Keahey says. Those bus routes would also have a healthy assist in speed. "Some of those [routes] will be able to take advantage of the managed lanes on MoPac under construction right now. So that'll provide an opportunity for some travel-time savings." The defeat of the light rail plan doesn't mean the end of Project Connect's transit system plan for the region. Project Connect still has $2.5 million in the bank, and work on the North and Central corridors will continue. $5.5 million was spent for the two years of work and planning that went into the light rail proposal, with roughly half coming from city funds and the other half coming from a federal grant. There's also another big rail project still in the works, though it's been decades in the making. It's the Lone Start commuter rail, which would go from Georgetown to San Antonio. If you live on Slaughter, you could hop on and one stop later be downtown. There's no property tax increase associated with the line either. It could be a real alternative to I-35 road travel, if it ever gets off the ground. Right now the proposal is entering its environmental process, which will take a few years. As for Keahey, what's next for him now that the rail plan is off the table? "We've begun some discussion on how my efforts can continue into next year," he says. "The problems are going to get worse before they get better, so my goal is to advance solutions." As we said, there's already a rail transit line in Austin: the MetroRail commuter Red Line. Keahey says expanding that service could be an option. "We're excited about what the Red Line opportunities are going to be," Keahey says, noting a commitment of over $60 million from state and federal agencies to add double-tracking in some sections and more vehicles to the commuter rail route, to increase frequency and capacity. With these improvements, the Red Line could go "from what essentially began as a commuter line and turn it into more of a hybrid between a light rail line and commuter line in terms of level of service," says Todd Hemingson, Vice-President of Strategic Planning & Development at Capital Metro. Within a few years, the Red Line could run every fifteen minutes, have much longer hours of service, and add Sunday service to the mix. "It could really be a trunk for the whole system," Hemingson says. But with all this attention paid to rail, some folks might have missed that there's already a huge mass transit system in Austin with well over 100,000 trips a day. Like it or not, the bus is the true backbone of Austin's transit system, and it's likely to be so for the foreseeable future. The bulk of Project Connect's system vision relies on bus service. So what's being done to improve the city's bus network? For starters, Capital Metro could consider a third rapid bus route along the East Riverside corridor. "For many of the same reasons we saw the potential for urban rail on that alignment, we think MetroRapid could potentially work there as well," Hemingson says. "But we're not going to suddenly flip a switch and say, 'Yeah, we're doing it tomorrow.' But the groundwork has very much been laid for high-capacity transit on Riverside. All the pieces are there." Martinez envisions several additional rapid bus lines and a pilot program for free rides. 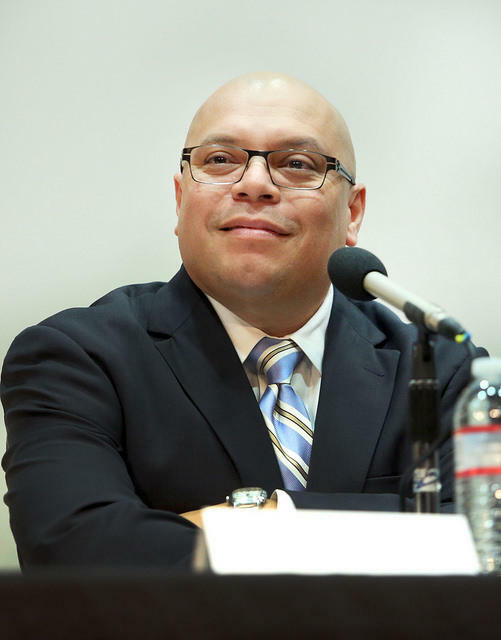 Current Capital Metro Chairman and mayoral candidate Councilman Mike Martinez this week echoed that thinking, calling for adding five to six additional rapid bus lines in Austin, including along East Riverside. Martinez also called for a pilot program to offer rides for free on Capital Metro, if a sponsoring partner can be found. Martinez said he thinks ridership in the city could double if his plans go into effect. Overall, ridership is down slightly this year for Austin's mass transit system of buses and commuter rail. Some high-ridership lines were cut in order to encourage passengers to switch over to MetroRapid buses, which caused ridership to drop. Fares went up system-wide and are going to increase again early next year. Bad weather in the winter also saw several days with reduced service, which cut into ridership numbers. Can a 'Basic' MetroRapid Speed Up to Go for Gold? 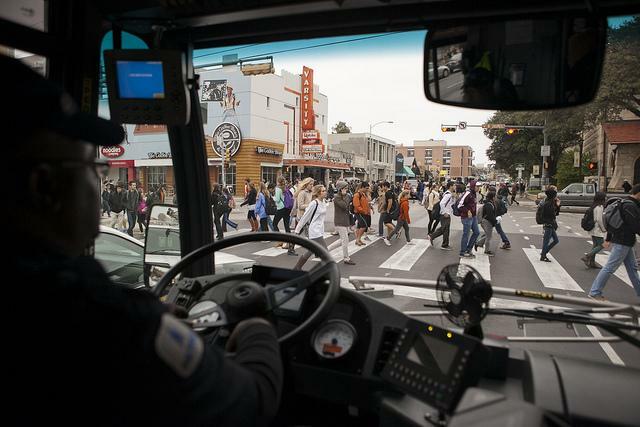 One challenge for Austin's MetroRapid bus routes is that they fall short of several standards for true "Bus Rapid Transit," known as BRT in the transit world. According to an international grading system, Austin's rapid bus barely qualifies as "basic" BRT, and falls well short of systems in other U.S. cities that rate "Silver" or "Gold." Austin's MetroRapid system's biggest challenge is that it lacks a dedicated lane along much of the route, and suffers through congestion in the same lanes as auto traffic. There's one section downtown from Cesar Chavez to Martin Luther King Boulevard that has a bus-only lane, but it's shared with local and express routes and there are two big bottlenecks waiting for the MetroRapid buses on either side: The South Lamar or the South First bridges as you cross the lake, or Guadalupe to the north. Transit advocates say that if the city does want to move forward with more rapid buses, they're going to need to have lanes free of car traffic in order to be truly "rapid." 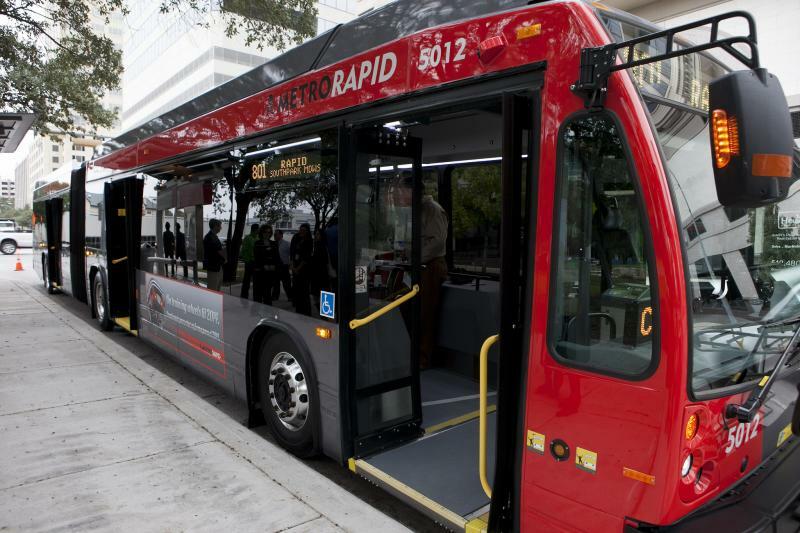 There are other smaller tweaks Capital Metro is also considering to boost MetroRapid's speeds, including "queue jumper" systems that would give the buses a head start at intersections before lights turn green for cars. Something also in the works for Capital Metro's overall bus system is a frequent transit network, where some bus routes with high ridership could have their frequency increased to every fifteen minutes or better "across the whole weekday," according to Hemingson, and it could happen as early as next year. Capital Metro is also adding bike racks across the fleet that hold three bikes instead of two. And soon real-time arrival info will be available for the entire bus system, so you'll know when exactly the next bus is coming (or, as can sometimes be the case, when it isn't). Mass transit in Austin didn't die with the failure of the light rail proposal, Hemingson says. "Just because this didn't pass, the need didn't disappear," he says. "If we don't begin to look beyond auto dependency, we're going to continue to see our problems get worse." This November, Austin voters will decide on one of the biggest expenditures in city history: a $1 billion proposal for a new light rail line and road improvements. 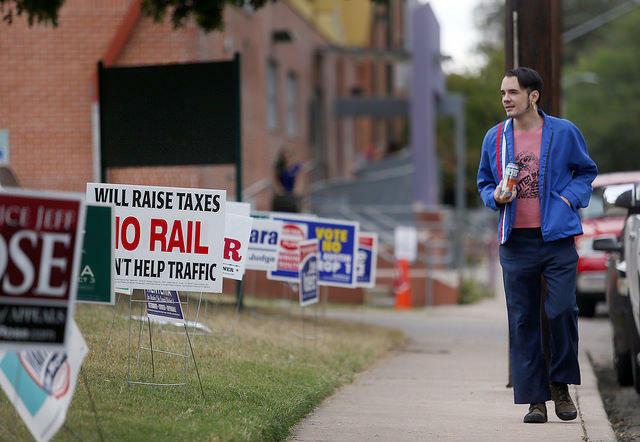 It’s not the first time light rail has come before Austin voters: 14 years ago, in 2000, rail was narrowly voted down. How and why that plan failed has informed the latest plan voters will decide on this year. If the light rail plan had passed back in 2000, one thing’s for sure: Austin's transit network would look very different today. The 15-mile line would have gone from Ben White and South Congress through downtown on Guadalupe and Lamar, all the way up past Parmer Lane. Think of it this way: if it had been built, you could have a burger at Hopdoddy on South Congress, then hop on a train up to Anderson Lane and Lamar, where it'd be a short hike or bike ride for another burger at the other Hopdoddy. "2000 was kind of a pivotal moment, I think, in planning for rail transit in Austin," says Jeff Wood with The Overhead Wire, a transit consulting firm in San Francisco. He's studied the 2000 vote closely. "You had this huge election, and George Bush was on the ballot, and it lost by less than 2,000 votes." While a slight majority of voters within city limits cast ballots in favor of the plan, the vote was in all of Capital Metro's service area at the time. Suburban voters were seen as pivotal in defeating the measure. That failure has informed the proposal Austinites are considering today. How? To start with, just take a look at the name. Austin's Light Rail Proposal Has Some Asking: Why Not Rapid Bus Instead? Disclosure: Project Connect and Capital Metro have been supporters of KUT. Fifteen years from now, someone in Austin is going to get to say, "I told you so." If voters approve a starter light rail proposal next week and it's built, by 2030 it's supposed to reach full steam, with some 16,000-18,000 trips per day (or roughly eight to nine thousand passengers a day). There has been a lot of debate about this proposal, even by Austin standards. A lot of that has been about the route of the line. The plan is to borrow $1 billion. $400 million would pay for some road improvement projects around Austin. The rest would partially pay for a 9.5 mile line that would run from East Riverside, through downtown and the UT campus, and terminate in the area around Highland Mall. But let's step aside from the route for a moment, and think about the tool. What if, instead of a light rail line, we opted for a Rapid Bus line instead?